Is there a better alternative to Navicat Monitor? Is Navicat Monitor really the best app in Network category? Will Navicat Monitor work good on macOS 10.13.4? Navicat Monitor is a safe, simple and agentless remote server monitoring tool that is packed with powerful features to make your monitoring effective as possible. Monitored servers include MySQL, MariaDB and Percona Server, and compatible with cloud databases like Amazon RDS, Amazon Aurora, Oracle Cloud, Google Cloud, Microsoft Azure and Alibaba Cloud. Navicat Monitor is a server-based software which can be accessed from anywhere via a web browser. Changed and reset Trial Period. Navicat Monitor needs a review. Be the first to review this app and get the discussion started! Navicat Monitor needs a rating. Be the first to rate this app and get the discussion started! 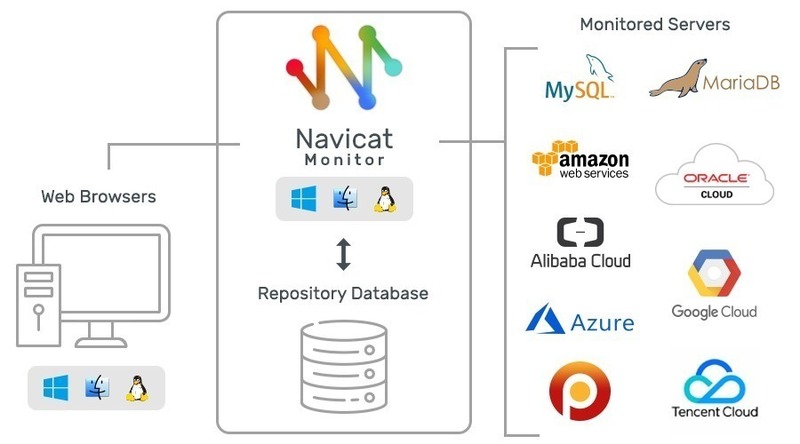 Navicat Monitor applies agentless architecture to monitor your MySQL, MariaDB and Percona servers, and collect metrics at regular intervals. It collects process metrics such as CPU load, RAM usage, and a variety of other resources over SSH/SNMP. Navicat Monitor can be installed on any local computer or virtual machine and does not require any software installation on the servers being monitored. Navicat Monitor requires a repository to store alerts and metrics for historical analysis. The repository database can be an existing MySQL, MariaDB, PostgreSQL, or Amazon RDS instance. Navicat Monitor includes a rich set of real-time and historical graphs that allow you to drill down into server statistic details. 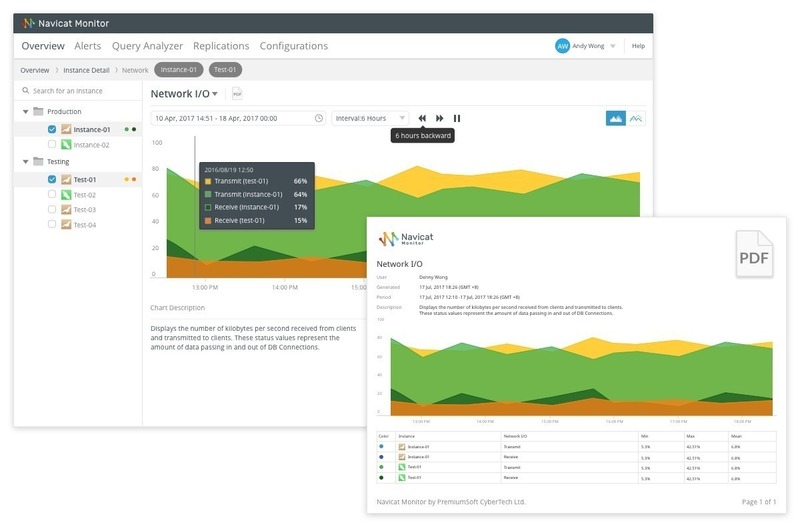 It gives you a detailed view of each server load and performance regarding its availability, disk usage, network I/O, table locks and more, which allows you to easily track the deviations and traffic among servers, as well as examine possible solutions and adjust your server settings. Our interactive dashboard lists all the monitored instances and allows you to easily see how your instances are currently functioning. It also gives you an overview of the performance, availability and health of each instance. Collect metrics of multiple instances on the same chart to compare and analyze data, and generate professional reports at incredible speed. You can also save your report as a high-quality PDF document with one click. 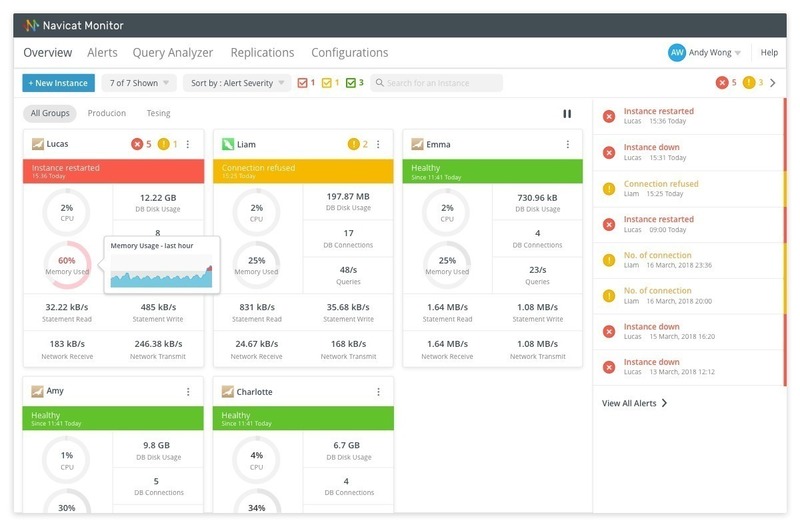 Monitor your queries in real time to quickly improve the performance and efficiency of your server. 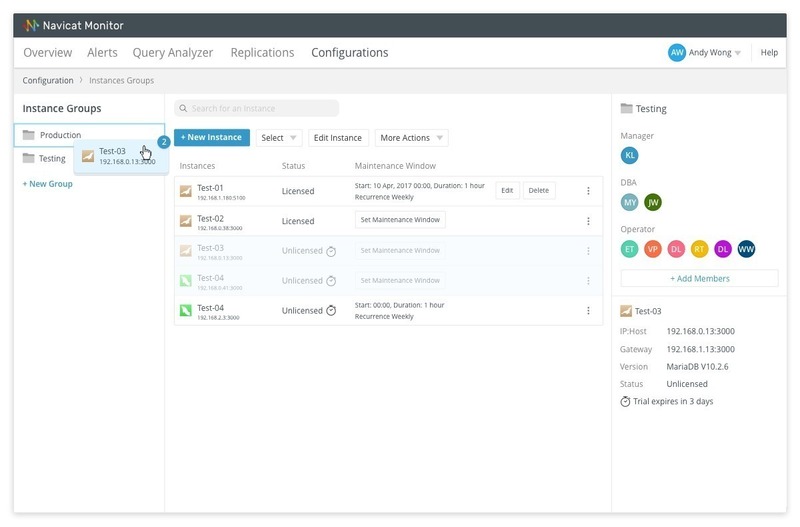 This powerful Query Analyzer shows the summary information of all executing queries and lets you easily uncover the problematic queries, such as identifying top queries with cumulative execution time count, slow queries with unacceptable response time, and detecting deadlocks when two or more queries permanently block each other. Navicat Monitor summarizes queries smartly so you get to see how many and which types of query are causing trouble. Apply schematic diagrams to visually represent the relationship between master servers and slaves. You can monitor the overall health of a replication topology as a whole, each individual node, and each replication subsystem to make sure the data on the replicated servers is always up to date. Save time to set up a new and different security method by configuring Navicat Monitor to authenticate with LDAP server or Active Directory. Organize your servers into groups to make it easier for users to find them by category. Assign users to specific groups as members and apply the same alert configuration settings to them effortlessly. All members will get notified when an alert is raised.